For a Kentucky rifleman who spent his tour trudging through Vietnam's Central Highlands, it was Nancy Sinatra's 'These Boots Are Made for Walkin'.' For a 'tunnel rat' who blew smoke into the Viet Cong's underground tunnels, it was Jimi Hendrix's 'Purple Haze.' For a black marine distraught over the assassination of Martin Luther King, Jr., it was Aretha Franklin's 'Chain of Fools.' And for countless other Vietnam vets, it was 'I Feel Like I'm Fixin' to Die,' 'Who'll Stop the Rain,' or the song that gives this book its title. 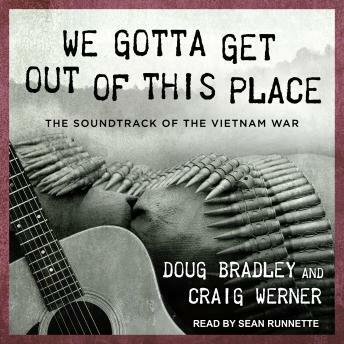 In We Gotta Get Out of This Place, Doug Bradley and Craig Werner place popular music at the heart of the American experience in Vietnam. They explore how and why U.S. troops turned to music as a way of connecting to each other and the World back home and of coping with the complexities of the war they had been sent to fight. They also demonstrate that music was important for every group of Vietnam veterans-black and white, Latino and Native American, men and women, officers and 'grunts'-whose personal reflections drive the book's narrative.